View of the Mevlâna Museum, the şadırvan and the green dome. Sultan 'Ala' al-Din Kayqubad, the Seljuk sultan who had invited Mevlâna to Konya, offered his rose garden as a fitting place to bury Rumi's father, Baha' ud-Din Walad (also written as Bahaeddin Veled), when he died on 12 January 1231. When Mevlâna died on 17 December 1273 he was buried next to his father. Mevlâna's successor Hüsamettin Çelebi decided to build a mausoleum (Kubbe-i-Hadra) over the grave of his master. The Seljuk construction, under architect Badr al-Din Tabrizi, was finished in 1274. Gürcü Hatun, the wife of the Seljuk Emir Suleyman Pervane, and Emir Alameddin Kayser funded the construction. The cylindrical drum of the dome originally rested on four pillars. The conical dome is covered with turquoise faience. One enters the museum through the main gate (Devisan Kapısı) to the marble-paved courtyard. The kitchen of the dervishes (Matbah) and the Hurrem Pasha tomb, built during the reign of Süleyman the Magnificent, are located on the right side. On the left side are 17 dervish cells lined up, covered with small domes, and built during the reign of Murad III. The kitchen was also used for educating the dervishes, teaching them the Sema. The ṣadirvan (washing fountain) in the middle of the courtyard was built by Yavuz Sultan Selim. 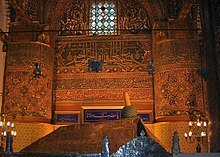 The sarcophagus of Mevlâna is located under the green dome (Kibab'ulaktab). It is covered with brocade, embroidered in gold with verses from the Koran. This, and all other covers, were a gift of sultan Abdul Hamid II in 1894. The actual burial chamber is located below it. Next to Mevlâna's sarcophagus are several others, including the sarcophagi of his father Bahaeddin Veled and his son Sultan Veled. The wooden sarcophagus of Mevlâna dates from the 12th century now stands over the grave of his father. It is a masterpiece of Seljuk woodcarving. The silver lattice, separating the sarcophagi from the main section, was built by Ilyas in 1579. The Ritual Hall (Semahane) was built under the reign of Süleyman the Magnificent at the same time as the adjoining small mosque. In this hall the dervishes used to perform the Sema, the ritual dance, on the rhythm of musical instruments such as, the kemence (a small violin with three strings), the keman (a larger violin), the halile (a small cymbal), the daire (a kind of tambourine), the kudüm (a drum), the rebab (a guitar) and the flute, played once by Mevlâna himself. All these instruments are on display in this room, together with an ancient Kirşehir praying rug (18th century), dervish clothes (Mevlâna's included) and four crystal mosque lamps (16th century, Egyptian Mameluk period). In this room one can also see a rare Divan-i-Kebir (a collection of lyric poetry) from 1366 and two fine specimens of Masnavis (books of poems written by Mevlâna) from 1278 and 1371. The adjoining small mosque (Masjid) is now used for the exhibition of a collection of old, illustrated Korans and extremely valuable prayer rugs. There is also a box (Sakal-i Ṣerif), decorated with nacre, containing the Holy Beard of Muhammad. The mausoleum was depicted on the reverse of the Turkish 5000 lira banknotes of 1981-1994. It received 2.5 million visitors in 2017, making it Turkey's most visited museum that year. ^ Crane, H. (1988). "BADR-AL-DĪN TABRĪZĪ". Encyclopaedia Iranica, Vol. III, Fasc. 4. p. 382. BADR-AL-DĪN TABRĪZĪ, architect and savant active in Konya in Anatolia during the third quarter of the thirteenth century. He is described by Aflākī (I, p. 389) as the architect (meʿmār) of the tomb of the great mystic poet Jalāl-al-Dīn Rūmī (d. 1273). He came to Anatolia probably as one of those Iranian craftsmen and men of learning who sought refuge in Asia Minor after the Mongol invasion of Iran in the middle of the thirteenth century. ^ Central Bank of the Republic of Turkey Archived 3 June 2009 at WebCite. Banknote Museum: 7. Emission Group - Five Thousand Turkish Lira - I. Series Archived 2 March 2010 at the Wayback Machine, II. Series Archived 2 March 2010 at the Wayback Machine & III. Series. – Retrieved on 20 April 2009. ^ "Museum, ancient site visitors rose 17 pct last year in Turkey". Hürriyet Daily News. 20 January 2018. Retrieved 24 March 2018. Wikimedia Commons has media related to Mevlana Museum. This page was last edited on 1 April 2019, at 06:14 (UTC).